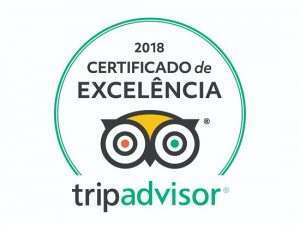 Unforgettable landscapes, history and lots of excitement on the FAVORITE tour of the tourists who visit the Magic Island, Florianópolis, There are more than a thousand positive reviews! 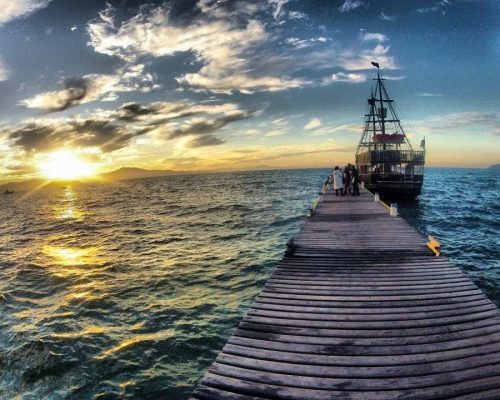 Have you ever imagined yourself inside a Pirate Ship by breaking into the most incredible places on Magic Island? Believe me, this is going to happen! Here on Captain Hook Martin Schooner dreams come true. 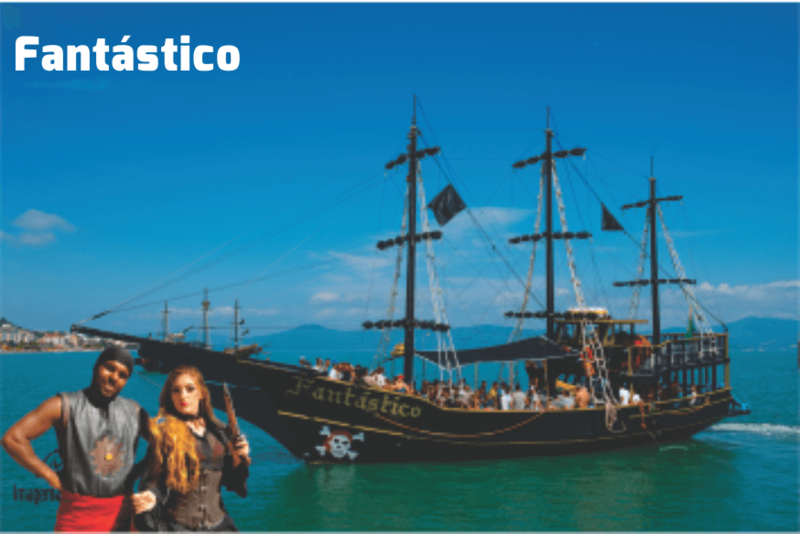 The most sought after tour in Florianópolis, incredible places, entertainment and fun guaranteed on behalf of our Pirates and the paradisiacal landscapes. We will return to the starting point, the docks of Canasvieiras, with an unforgettable memory. This is where our adventure begins, are you ready? 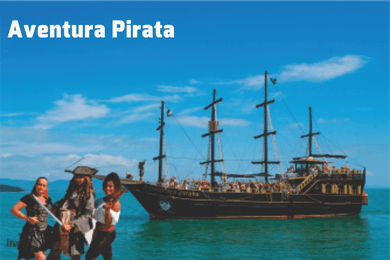 When you arrive at the Canasvieiras docks you will notice a great movement of candidates to embark on this pirate adventure, so guarantee your place not leaving to make the reservation on time. Present your reservation in Box number 4 of the BILHETERIA, there you will be guided until you get on the Pirate Ship. Do not worry, the place is signposted and has employees prepared to better serve you! 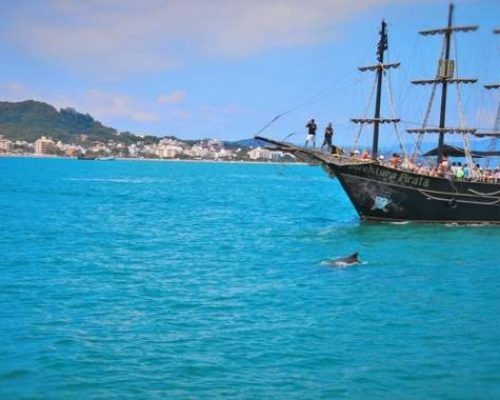 The name is already very inviting, but it is important to know that the Bay of Dolphins is an area of environmental preservation, in fact, our pirate ships are one of the few that are authorized to enter this area. Therefore, bathing is not permitted at this location. This preservation area is centered throughout our itinerary, that is, we can spot the dolphins at any time during the adventure. It is important to note that they are free in nature and we do not always see them, but the cool thing is that when you see one, most likely he will not be alone. 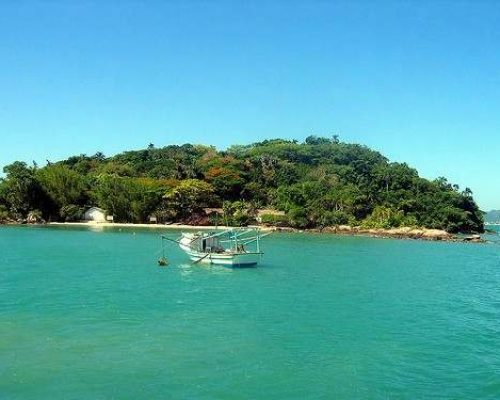 Located in the mainland, in the municipality of Governador Celso Ramos, we have our stop of 1h (one hour) for lunch during the tour. There you can choose whether you prefer free buffet, a la carte options or you can take your own food and stay enjoying the beach. The waters of this beach are calm and crystalline, the thick and dark sand, marked by thousands of shells scattered for approximately 300 meters in length. Beautiful landscapes and many fantastic stories are what you will find on the beautiful island of Anhatomirim. Our stop is approximately 1h (one hour), and an accredited guide will tell you the mysteries and history of the island that will make you go back in time. Every bit of the Island awakens in you unique and inexplicable sensations. The name Anahotomirim derives from the Tupi “Little Devil’s Island” – most likely because it is isolated and is a large prison. Oh, you are curious, right? So come and ride with us and check out all these stories on our Blog. Near this island, still on the high seas, we have one of the most awaited stops of the tour. Finally it was time for the sea bath. It is about 20 minutes to immerse yourself in these magical waters, an excellent opportunity to refresh yourself. 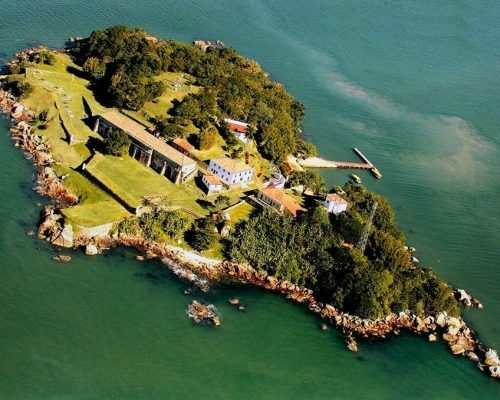 Curiosity on the Island of the French: The Island is Private, that is, a person has its concession, actually today it is no more of a French citizen, but of an Argentine. Pirate Boat Ride every day. 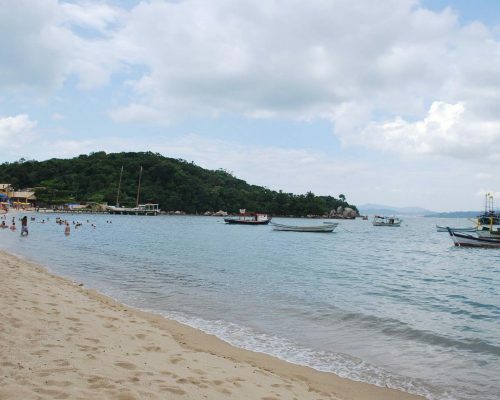 Trapiche de Canasvieiras, Florianópolis - SC, 88054-160. Get your place on the Pirate Boat ride and choose the day and time you prefer to do the tour. You can choose between several forms of payment, paying in advance or just at the starting point. 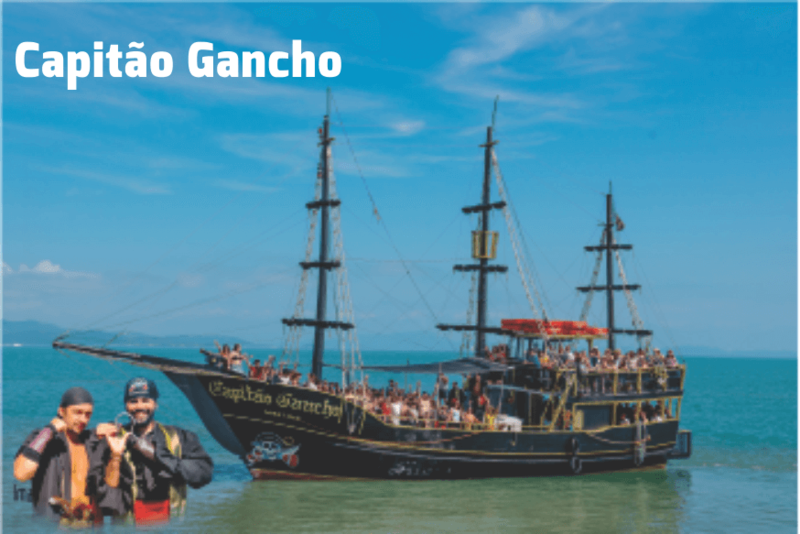 Now that your vacancy is already guaranteed, it is time to embark on the Pirate Ship and start the adventure, boarding is done at Trapiche de Canasvieiras. After boarding, start the tour, enjoy the unforgettable landscapes and all the animation of the most fun pirates of the 7 seas. Any problem, you can speak to our crew and we will help. We have 3 pirate ships at your disposal, each with its differences and a special crew. They are equipped with sound system to ensure your enjoyment during the ride, a bar on board non-mandatory consumption, as well as own bathrooms. Pirate ships are highly secure with lifejackets and a crew prepared to handle any situation. All to provide the best experience for anyone planning to sail with us! Boat Captain Hook: capacity of 150 people. A crew of pirates trained in the art of having fun, always prepared to help you that united with the great pirate schooners make this experience even more exciting for all ages, especially for children, is one of those memories that never fade. Not to mention the lively soundtrack to keep everyone happy throughout the entire journey. Ride hard on average 5 hours. During the Summer: We have the option of the tour that lasts in average 3 hours, passing through the same points, without the stop for lunch. When the purchase is made online, the customer receives a sales receipt, which must be presented in the Online Sales Booth located in Trapiche to receive their incoming tickets. Tickets will be presented at the time of shipment along with a personal identification document. Lunch: R $ 35 (thirty-five brazilian reals), free buffet- eat all you can- at one of the restaurants in Praia da Armação (a beach). The boats have on-board bar, of optional consumption. No show means no show at the date and time reserved for the tour. 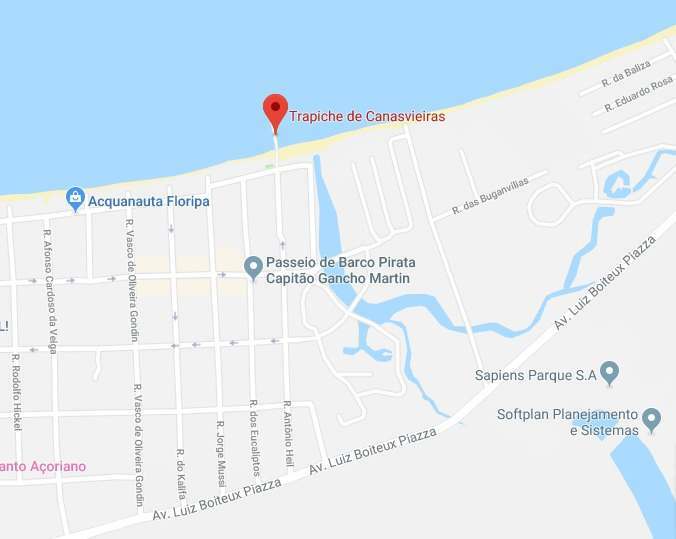 It is necessary to be in the Trapiche de Canasvieiras before the scheduled time for embarkation, being that your vacancy will be available until 15 minutes before the beginning embarque. From there, the vacancy will no longer be available; if there is a vacancy in subsequent shipments, the customer will be reallocated.